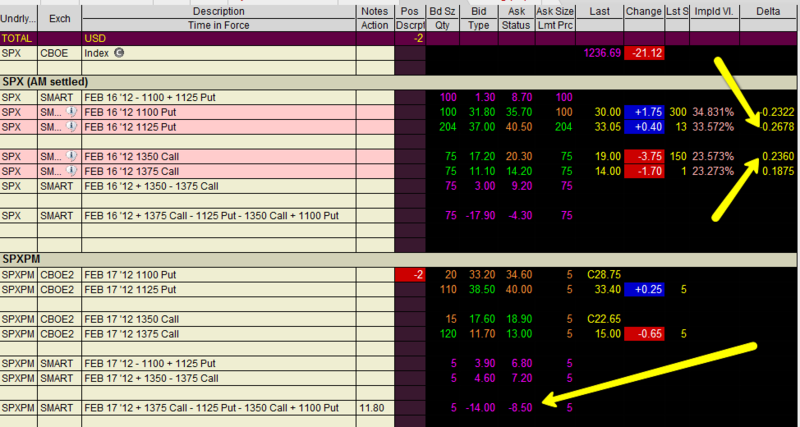 Let’s look at a CTM (closer to the money) iron condor. Full Screen Video Recommended. The font size may be too small in the video below. Midpoint for iron condor is now $12.25. SPX is down another 23 points. Here is the live data at that time. 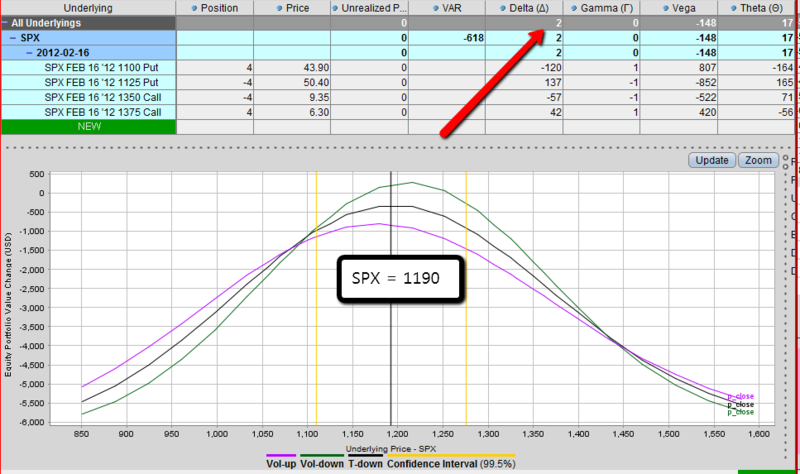 The white arrows point to the implied volatility and delta for our most at risk option – the Nov 1125 put. The 30 delta may appear to be worrisome, but let’s remember that we made the trade with 25 detla options and it is far too soon to consider making any adjustments to this position. Note that we are nearer to delta neutral than when we began, so the decline has been good, and not worrisome. So far. Well, it’s 9:20 am and SPX is down another 25 points to 1190. This should be a situation that worries us – fast falling markets, IV moving higher (not by much) and the delta of our short option is 30. Yet, we can exit this trade at roughly $10.70 or perhaps 10.80. 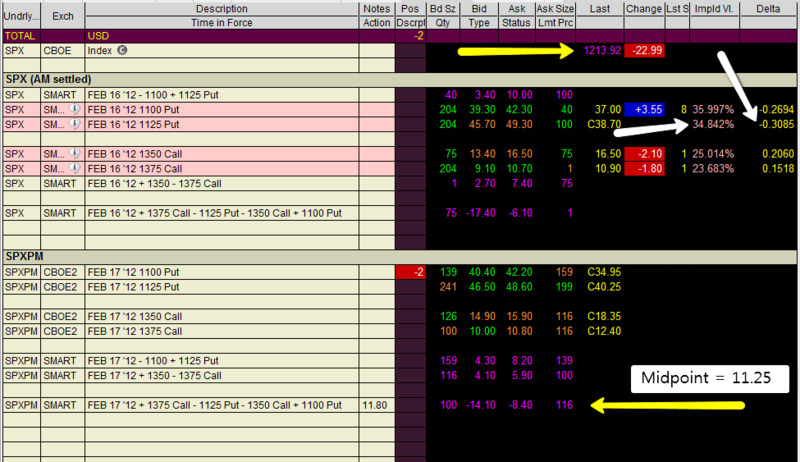 If anyone owns this trade and if this makes you nervous, it’s an easy decision to exit – especially with a profit. For now, I’m holding this trade, with no adjustments. SPX down 22 points today to 1166. 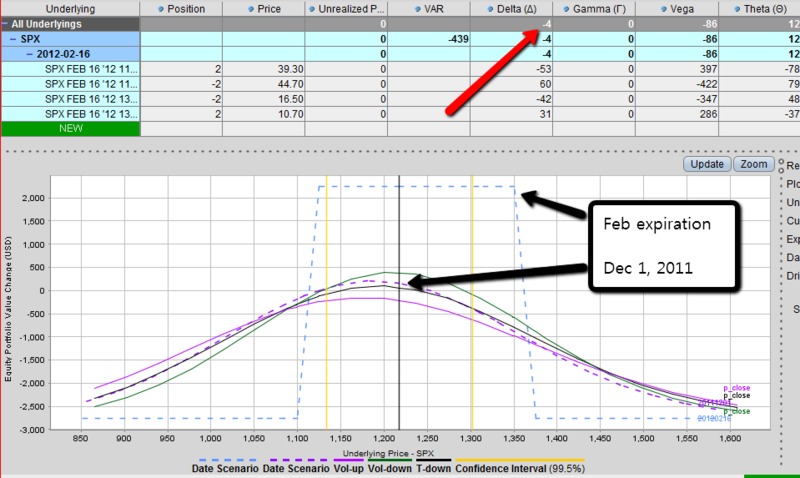 With VIX holding (33.52), the iron condor is not increasing in value. The midpoint is $20.80, and we can exit at a profit. If you own this position and the delta of the 1125 put (34) makes you nervous, this is an opportune time to get out, eliminate risk, and make a bit of cash for your effort. I am holding this position. SPX was up 41, now higher by 38 points, and was upon ‘only’ 33 when the image was taken. 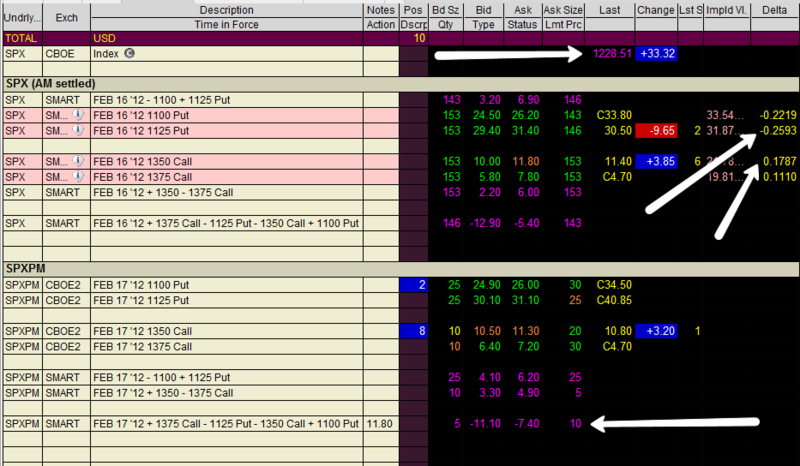 Midpoint is $9.25 and we have an ongoing profit. With the deltas at reasonable levels (18 and 26), there is no reason to make any adjustments. For traders who prefer to lock in profits, go for it. For me, it is too soon. If I exit here, I would sell another Feb iron condor. If you find something that you prefer to own, then it may be appropriate to exit and open the preferred iron condor. Just remember that when we trade we always give up some edge by selling below the quote midpoint and paying above Thus, make this ‘position switch’ only when you have a good reason to do so. Markets moving, but it’s all good for our position. Nothing to do. This is working as well as as IC can work. Time passes and IV declines. Today’s rally is good for our position. If satisfied with the profits, feel free to exit a trade in this situation. However, there is no reason for us to do so. There is no point in following this trade any further. I’d be bidding to exit so I can rebalance. On the other hand this trade has been a big winner, and there is no urgency to get out. The deltas are decent at 14 and 8. It’s a comfort zone decision. But I believe this is a good spot to rebalance the portfolio. If holding, I’d look at this position every day – looking for an exit point.